This is a top-down raglan with a scoop neck. 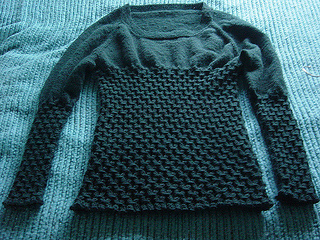 The lower half of the sleeves and the lower half of the body are smocked. It can be adjusted for different sizes and yarns. The neckband is knit first -- simply because I didn’t know that it was supposed to be knitted last when I started out knitting sweaters.